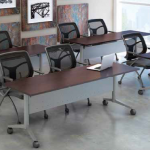 Show your employees that you care for their comfort while they learn with a new training tables from Golden State. Our sturdy and easy to arrange training tables are perfect for training of all types. We have the easy to set up training tables that fit within your budget. When you use our sturdy and easy to arrange tables, your training sessions will be worry-free. but will bring style and warmth to the workplace. Ideal for classroom, meeting and institutional applications, these heavy duty flip top tables provide flexibility and convenience at an outstanding price. Featuring a quick response lever and locking casters these tables are designed so they may be nested together for easy storage. Tops are available in a variety of finishes; bases available in black and titanium.